A black and white photo of people standing and talking along a brick wall in Boston. Along the Boston Waterfront, you run into fun placed for Engagement Photos. There is a lot to work with, but if the lights not there, it's not there. This day was one of those days when the light just wasn't where I wanted. 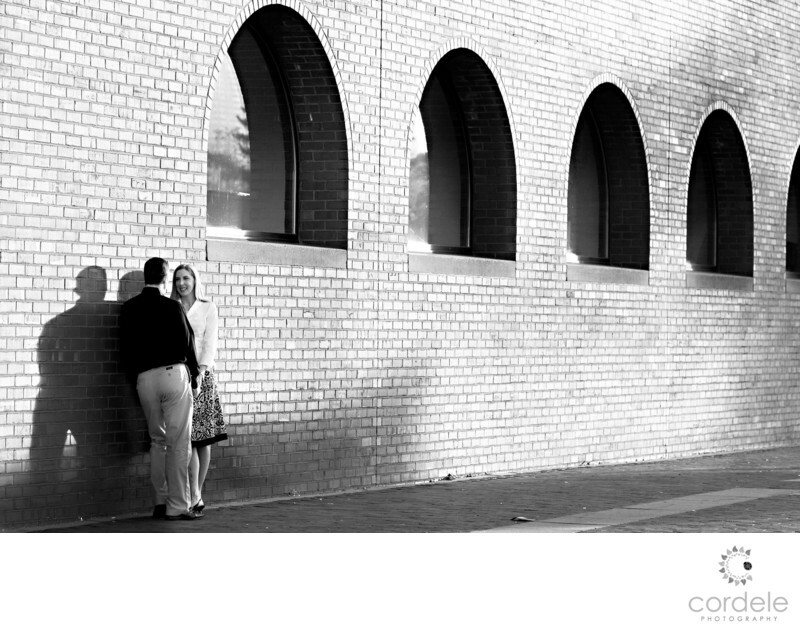 I found this interesting row of windows and I put the couple up against the brick wall. I had once had the photo in color, but I realized that the black and white really made it pop. I love making old photos new again. This photo I took years ago and I was going through old photos and cleaning some stuff up. I ended up taking this photo and turning black and white. I loved how the bricks came alive and the windows really popped. They draw you into the photo and lead you to the couple. We shot this photo down on the Waterfront in the North End of Boston. I was struggling a bit with the light because the sun wasn't quiet behind the buildings yet, and the park was crawling with people. Sometimes people are good, but it was just a little too busy to make the photos I wanted.